The summer season is probably the most ideal season to hold exciting events and parties, though some people may say that it’s the spring season but others still believe that summer holds more parties than spring. The reason behind that is because summer is basically the perfect season to go to the beach to swim or simply to relax under the sun. During this season, you’ll find beaches filled with people who want to spend quality time for themselves, or those who have been waiting for the warm weather to come following the end of the winter season’s coolness. You can also read tickets for an event. You may be wondering why we brought that topic up, and the reason behind that is because the templates we have below are tools that you will need if ever you decide on throwing a summer party. 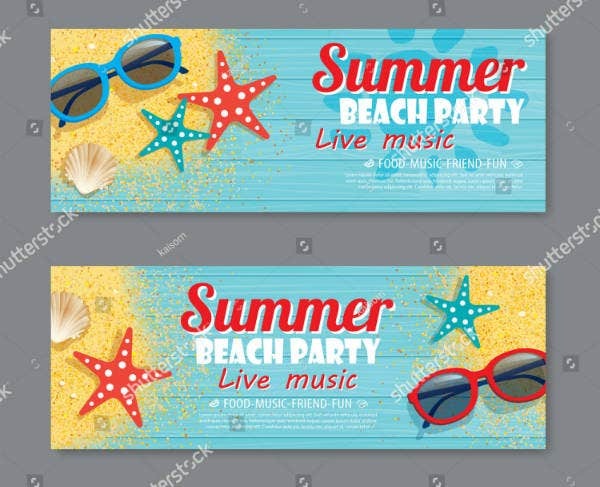 We have a collection of ticket designs and templates that you can use for any kind of summer party or summer-themed party, there’s actually a difference between the two. There are around fourteen different designs that you can choose from, feel free to check them out first before deciding to download one. Planning to throw a beach party this summer season? You might also want to add in a little retro theme to make the event a little more interesting. For whatever reason, a retro theme seems to really fit the summer season, specifically summer parties. 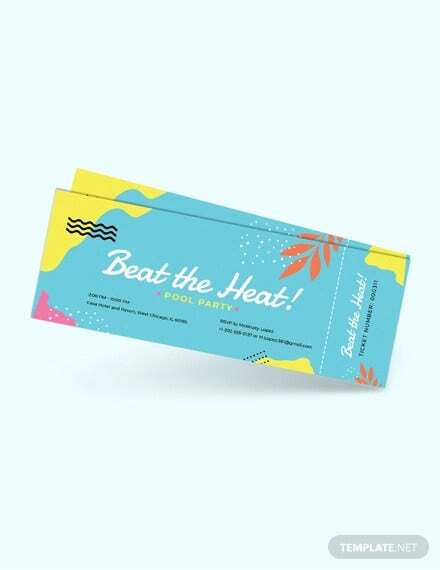 Check out the retro-styled admission ticket template above, this would be a great template to use for making summer parties regardless of the color theme. If you think that this template is indeed perfect for your event, then start downloading it now. Here’s something that may sound like the perfect choice for making do-it-yourself party ticket templates. 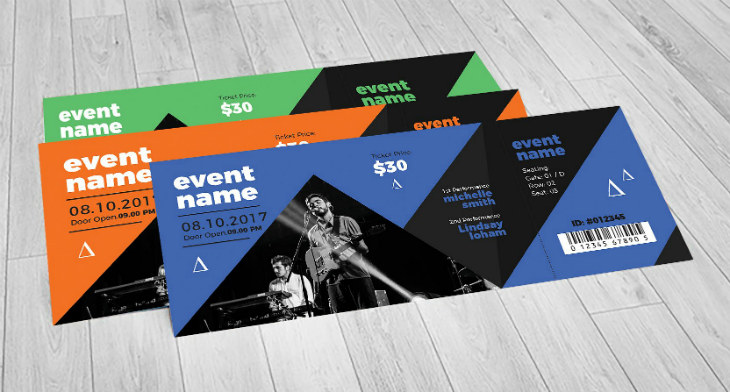 This modern-looking entry ticket template may seem like the perfect way to convey a good and exciting first impression regarding the event. At first glance, you can already assume that this summer party will indeed have a beach theme with its use of the colors yellow and blue, and the inclusion of the male or female subject basking under the heat of the sun. Summer parties may either be held at the beach, or in other cases, at the swimming pool. 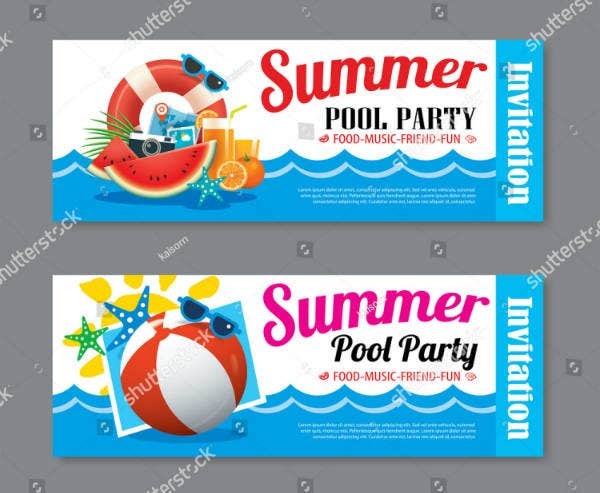 With this summer ticket template, while the theme remains the same with both design, the difference is that one design bears an image of a life buoy while the other shows a red and white beach ball. 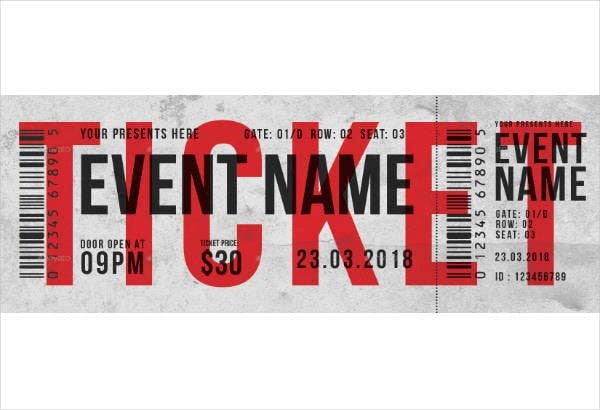 This ticket template may be used not only for making tickets for paid parties, but they can also be used for making sample party invitations. 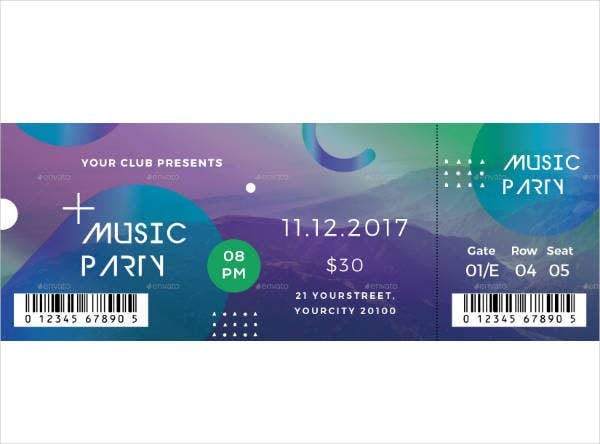 Whichever design you wish to use and whatever reason you have for using these templates, we guarantee that your tickets or invitations for the party will indeed capture the attention it deserves. 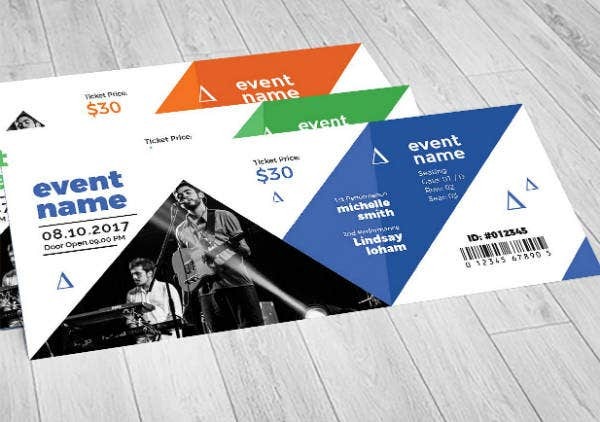 Here is a simple yet modern printable ticket template that you may want to use for any type of event that you have in mind. This template comes in various color schemes that you can choose from, but not only that, you can even choose to download either in AI format or PSD. To those who aren’t quite familiar with any of these formats, AI is a vector-based format that can be edited using Adobe Illustrator while PSD stands for Photoshop Document and is a native format on Adobe’s own Photoshop software. Regardless of which format you wish to use, this template is fully workable for your convenience. During summer, one of the most common parties that you can find being held here and there are music or concerts events, and many of these are even held in beaches. 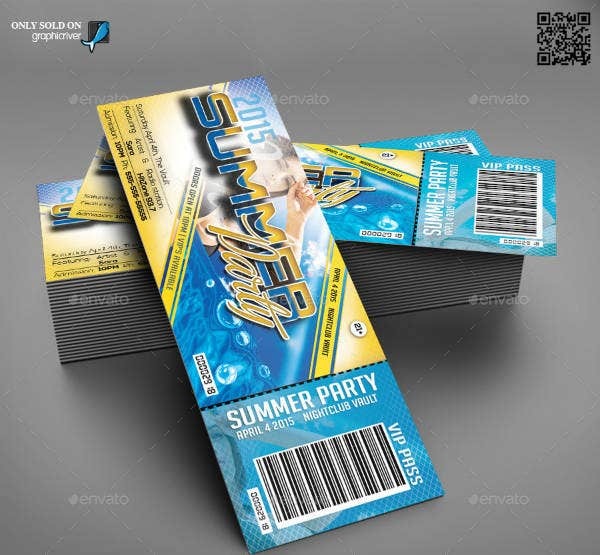 While this entrance ticket template isn’t specifically intended for summer parties, it is very easy to edit and with a subtle change in the design, this template will most likely leave you with the perfect tickets for your summer music party. If that got you excited, then go ahead and download this template now. Children love to go swimming, and it won’t even matter where. The beach, the pool, the river, or even inside an inflatable pool at the convenience of your own home, these make children excited and happy. 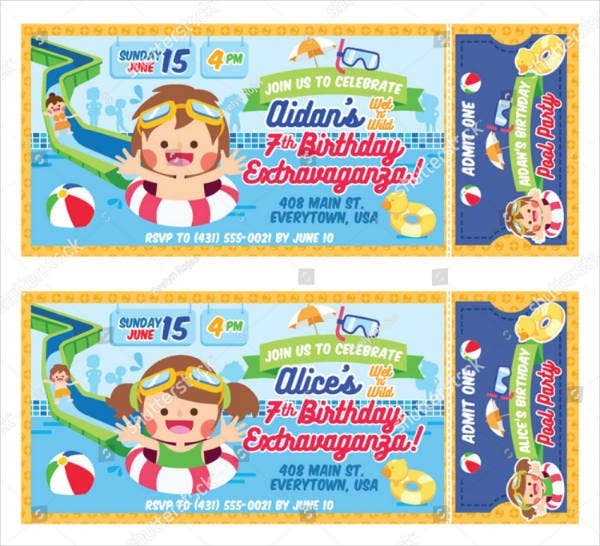 If you’re planning to throw a child’s summer birthday party at the pool, then the ticket template above will definitely be a good idea. The illustration style on this template is already enough to get children excited once they lay eyes on it. 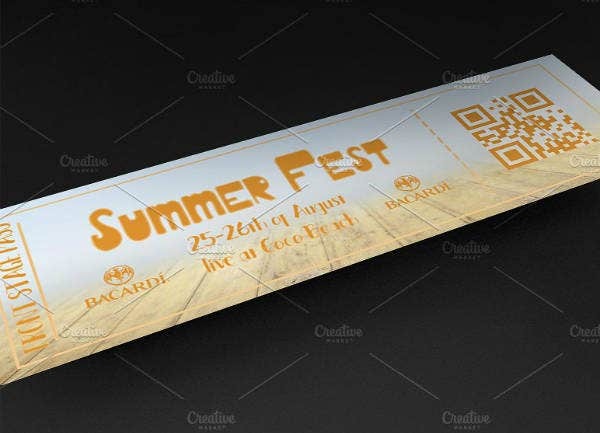 Looking for a simple-looking template to help you make your own summer fest tickets? Here’s one that might interest you in a way. This one might not be the most artistic in this collection, but it sure is simple to look at and fully editable. This template comes in high-quality PSD format, and as mentioned earlier, is a format designed by Adobe for their own Photoshop. What that means is that to be able to enjoy this template’s capacity, you will need to edit it using Adobe Photoshop. If you already have that software installed on your system and you find this PSD ticket template desirable, then start downloading it now. 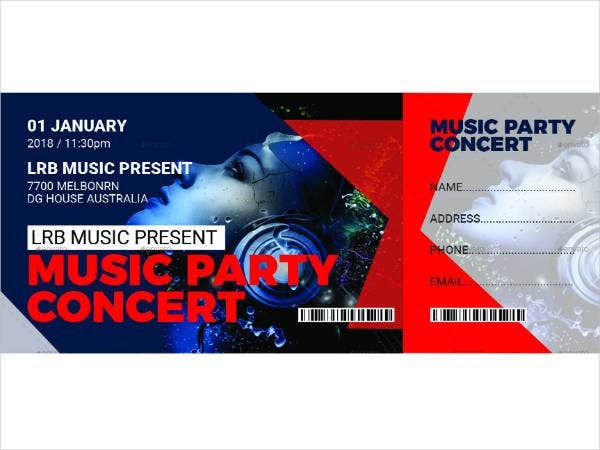 Here is another multipurpose event admission ticket template brought to you by the same graphic artist who designed the awesome music party ticket template that you have just seen earlier. However, this template is much more flexible than the previous one. Why is that so? Because this one can be used for making a wider range of event tickets, not just for music parties. The design on this template is also more on the minimalistic side, which gives you more freedom to edit it according to how you really want it. Did you find the previous kid’s birthday pool party interesting but not exactly what you were looking for? 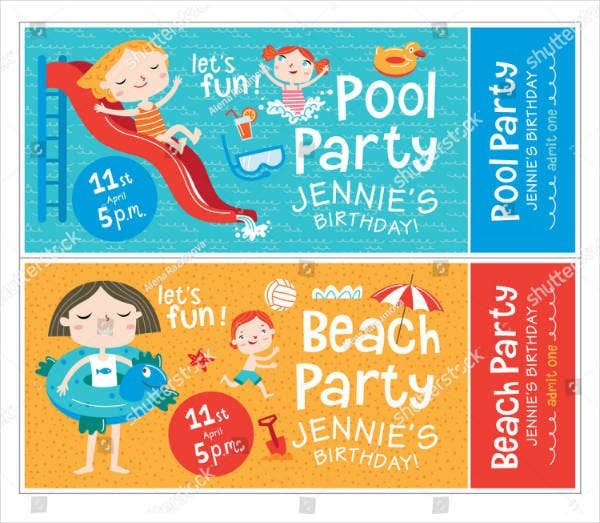 Well, here’s another birthday party ticket template for you that you can choose to use for making your very own pool party in honor of a child’s birthday. Here, you can even choose among two distinguishable and uniquely illustrated designs depending on the theme of the party or the gender of the birthday celebrant. What type of party are you trying to organize this summer? Is it a beach party? Or is it something else? 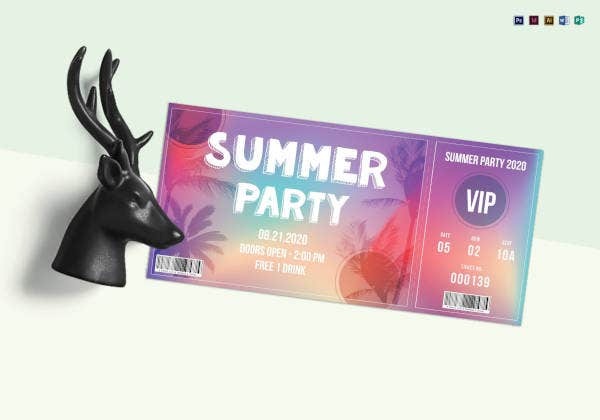 Check out the ticket template above that you can use for making summer party tickets. For one thing about the design on this template, it could go two ways: it could be seen as either the surface under the water or as a rustic-looking surface. Notable details included on this design are the QR and bar codes found on the lower right corner of the ticket. But nevertheless, this ticket template would be perfect for any type of summer party. You may be wondering, “what does this template have something to do with summer?”, which may be quite understandable considering there’s no image of a beach, the sun, or any object that you can commonly see during the summer season. 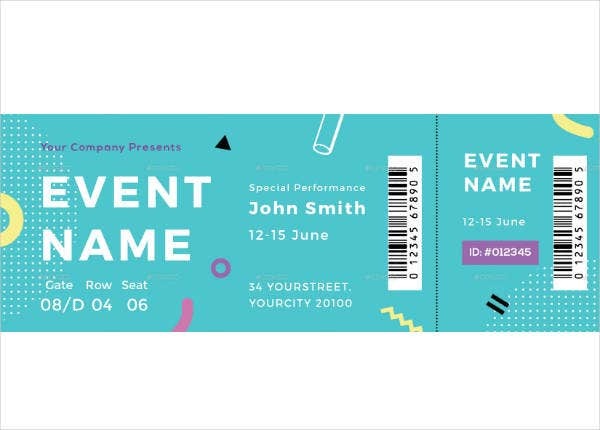 But the design on a ticket doesn’t have to entirely speak for itself, you may even use a highly minimalist design on your tickets for your summer party. You can also check out free printable ticket templates. The important thing is that the design is able to convey what to expect from the party—such as the theme—and the relevant details regarding the event. 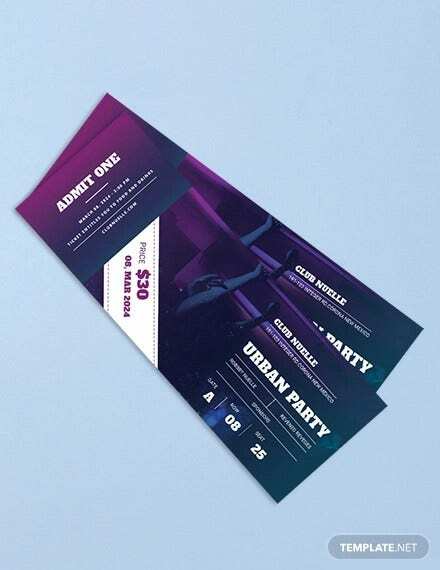 For this sample ticket template, though it may seem minimalist, it is also something that’s more on the typographic side than graphic, which makes it highly versatile and usable regardless of the type of party. Here’s a printable ticket template taken from Shutterstock that comes in two distinct designs. While there isn’t actually much difference the two except for the swapped placement of some elements, it still has a few pros such as one design providing you with enough space to write other details regarding the event, or the other design being more “balanced” in terms of the use of its space. Nevertheless, this template won’t cost you a lot to download, so why not use both designs instead? Another common type of party that you’ll find during the summer season are a concert or music parties. It is actually a good strategy to hold concerts during summer because many people—especially school-aged ones—are free during these days, giving them a higher chance of being able to attend the event. If you are indeed throwing a concert party, schedule it within the summer season and use this concert ticket template. Lastly, here’s a simplistic beach-themed event ticket template for those looking for something with a not-too-complex design. 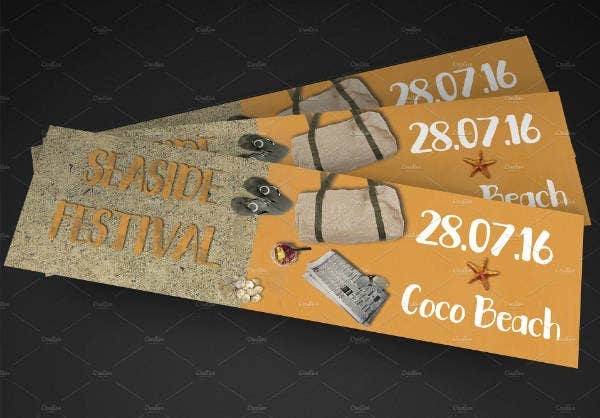 The design on this template is divided into two parts, with the left half having a sand-like texture and the name of the event, and the right half containing the date andhttps://www.template.net/design-templates/print/printable-ticket-template/ location of the event written over a solid-colored background. This high quality PSD template is fully editable, and also comes with a free font, so why not use this one? It will only cost you $6.00. A ticketing system can help you determine the number of people who are going to attend as well as the number of people present in the event. It also allows you to create a targeted mailing list, meaning if you are planning to throw another event, you can reach out to people who have already been to one of your previous events. Tickets can help you keep track on the number of people who are actually coming in through the gates. You can also read create tickets in microsoft word. It will also help identify the specific areas that are busiest, prompting you to focus your crowd management efforts on those areas. That said, a ticketing system will also let you easily process refunds if ever there is a need. There will always be instances when people ask for a refund—which they actually deserve—and having tickets make that process easier. 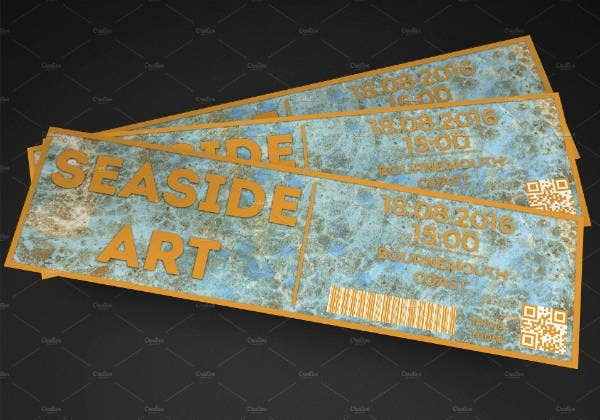 You can also check out creative event ticket designs.